Bruxism (also known as teeth grinding) affects almost one-third of the population and usually occurs as a result of stress. Common symptoms include a sore jaw, headaches, earaches, and teeth that appear damaged or worn down. If left untreated for long, bruxism can develop into a much more painful case of TMJ dysfunction, as well as insomnia, eating disorders, and depression. Teeth grinding is not an easy habit to break on your own, however, because it mostly happens while you sleep. Fortunately, Dr. Barsky can design a custom-made orthodontic appliance known as a nightguard for you to wear during the night. This will keep your teeth safe from further structural damage and will also reduce any jaw discomfort you are experiencing, so you can finally get a peaceful night of rest. If you think you may be suffering from bruxism, please do not hesitate to notify our office. We will perform a thorough evaluation of your teeth, tissue, and muscles to determine if your hunch is correct. 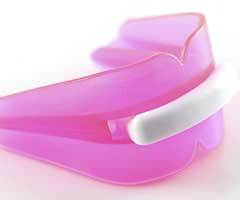 If we do find proof of teeth grinding, then a nightguard can be a convenient solution. Did you know that nearly half of all sports injuries involve the face in some way? When you are on the field or court, you should not need to worry about whether or not your smile will survive the game. Instead, play confidently with the help of a sportsguard. Dr. Barsky can design this custom-made oral appliance to fit comfortably in your mouth and over your teeth, protecting them from damage. Recent studies show that wearing a mouthguard can also reduce the severity of concussions.